Welcome to the Trail Riverfront Centre - library, museum & visitor centre. Welcome to the Trail Regional Airport - YZZ! NOW OPEN! Trail SK8 Park! Pool closed June 14-16 for annual swim-a-thon. See facility hours of operation for info. Pool closed this week for annual Swim Meet. See facility hours of operation for more info. 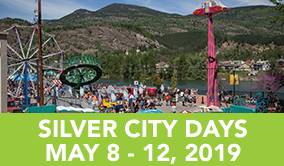 Silver City Days is May 8 to 12, 2019! Join us!